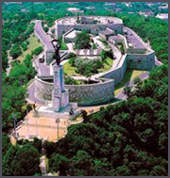 Castle Hill - home to what you might call Buda's 'old town' - has been a cultural and strategic focal point of the city for centuries and was also the site of over 30 sieges. The inevitable damage resulted in several episodes of rebuilding, often re-using stones from the rubble and lending to the district a fascinating mix of architectural styles. The views over Pest from the BudaRoyal Palace and the Fishermen's Bastion will take your breath away. Visible from almost everywhere in Budapest, Gellért Hill (Gellérthegy), with the impressive Freedom Monument on its peak, is one of the city's memorable landmarks. The 14-metre monument was originally commissioned by Miklós Horthy as a memorial to his son, who died in a wartime air accident. When the Russians arrived, they replaced the propeller that the figure was originally meant to hold aloft with a palm frond to symbolize the country's liberation from the Nazis. Just beyond the monument is the Citadella, a fortress constructed by the Habsburgs following the 1848-1849 war of independence. With the Buda Castle in the background, the Hungarian capital's first bridge is a fascinating spectacle that has attracted many tourists to Budapest. The bridge was built upon the request of Count IstvánSzéchenyi by designer William Tierney Clark and engineer Adam Clark between 1839 and 1849. Like many other Danube bridges, the Chain Bridge did not survive the ravages of the World War, so it had to be rebuilt in 1949, marking the centenary of its first opening. Budapest's playground, car-free Margaret Island (Margitsziget) has everything you need to enjoy a relaxing day - including sport stadium, numerous tennis courts, outdoor swimming complex, an open air theatre, Japanese and Rose gardens, early medieval ruins, two spa hotels and a beer garden. The world's second largest parliament building is a postcard favourite, particularly when reflected in the River Danube below it. The Parliament, built in Neo-Gothic style and located on the bank of the Danube, serves as the permanent seat of the National Assembly. The building complex, the biggest of its kind in Hungary, was erected between 1884 and 1904 on the plans of ImreSteindl. The building has 691 rooms, and it is 268 metres long and the dome 96 metres high. Since 2000, the Hungarian coronation symbols —St. Stephen's crown, the sceptre, the orb and the Renaissance sword— have been on display in the Parliament. Named after SzentIstván (St Stephen) founder of the Hungarian Christian state, the basilica is the largest church and its 96-metre dome can be seen from virtually all parts of the city. The Basilica's construction begun in 1851, and was completed by JózsefKauser in 1905. The Classicist-style building houses Hungary's most sacred relic: the Holy Right, which is the mummified right hand of St. Stephen. This synagogue is the second largest in the world (after the one in New York). It has three naves and following orthodox tradition, separate galleries for women. Together the naves and galleries can accommodate up to 3,000 worshippers. It is also a focal point of Budapest's thriving Jewish community, which holds an annual festival in and around the impressive building. The Hungarian State Opera House is a neo-Renaissance building, designed by MiklósYbl, a major figure of 19th century Hungarian architecture. The construction lasted from 1875 to 1884 and was funded by the city of Budapest and by Emperor Franz Joseph of Austria-Hungary. The Hungarian Royal Opera House opened to the public in 1884 and the first performances ever held here were the Lohengrin and BánkBán. The electric lights system in the building has been in place since 1895. The entrance of the building is guarded by the statues of Ferenc Liszt and FerencErkel. The Opera can be visited on a guided tour as well. Andrássy Avenue is a 2,310-metre boulevard lined with buildings in uniform architecture and linking the City Centre with the City Park. Andrássy Avenue, including the Millennium Underground Railway, running beneath the surface, as well as Heroes' Square, located at is end, was recognised as a World Heritage Site in 2002. It accommodates the crème de la crème of Eclectic-style buildings in Budapest, among them a wealth of residential houses with wonderful and intimate inner courts, statues and foundations. Located at the end of Andrássy Avenue, Heroes' Square is the entrance to the City Park as well as one of the most spectacular monuments in Budapest. The three main sites of the square include the Hall of Art, built in 1896, the Museum of Fine Arts, inaugurated in December 1906, as well as the Millennium Monument, linking both buildings visually. The crescent-shaped monument was built in Eclectic style. The semi-circular arcades of the monument on the left and right-hand side each hold bronze statues of seven outstanding personalities of Hungarian history. Budapest's second favourite park after Margitsziget, the City Park (Városliget) is situated behind and to the right of Heroes' Square as you approach from the centre of town. The first trees and planted walkways were established in 1751 and after the public park was created in the first decades of the 19th century the present-day name, Városliget was accepted and it became the first public park in the world.